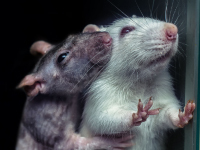 Scientists and researchers frequently make use of animals as part of their studies, with rodents such as mice and rats comprising nearly 95% of choice in laboratory testing. This guide will provide an introduction to basic rodent handling strategies and identification techniques to determine the most effective method of practice for the laboratory's needs. Proper gear will help reduce the risk of exposure to animal allergens and pathogens. It is not recommended to wear gloves that are too thick, as it reduces the ability for more refined motor movements and gauge pressure control. Rodents are generally social and harmless species by nature. However, factors such as age and gender can influence their level of aggression. If stressed, frightened, or threatened, they will inflict painful bites or scratch wounds. Animals are therefore best approached in a calm and collected manner, avoiding sudden motions or noises that may alarm them. In the event that a bite or scratch has been inflicted on the handler, calmly return the rodent to its enclosure, and proceed to immediately treat the wound. Though it is relatively uncommon for inbred laboratory rodents to possess hazardous pathogens in their saliva, there is a potential risk of secondary infection. The injured party should wash and bandage the wound, then notify their supervisor. Seek additional medical care if necessary. There are several acceptable methods for handling laboratory rodents. It is essential to adequately assess the behavioral characteristics of the rodents before committing to an appropriate handling technique. Recent studies have demonstrated the beneficial effects of handling the rodent multiple times prior to the start of the study to acclimatize being held later in life. This concept, known as ‘bioprotection’, suggests that animals who have been handled early in life will only react to the particular experimental stimuli used in the study, whereas non-handled animals are much more likely to react to the new handler as well as to the test situation (Sue et al, 2004). If the rodent is docile and has been habituated to handling by an experienced, confident handler, a simple body scoop will do. Support the rodent's abdomen with the hand, then wrap the thumb and forefinger around the thorax near the front legs. Initially, rodents should be gripped loosely enough so that they will not jump or squirm out, yet not so hard that it will cause them physical danger. With repeated exposure, the handler may be able to cup the particular rodent with open palms and without much need for gripping. For unfamiliar or aggressive rodents, a tail hold is a more standard method. Grasp the base of the tail, then gently lift. If the rodent is pregnant or in the neonatal stage, support the body weight with the other hand, as excess pressure can break or damage the tail. 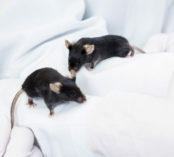 It should be noted that recent studies have found that picking up mice by the tail induces aversion and high anxiety, which can have negative effects on future behaviors. It is recommended to use a handling tunnel as a secure and reliable method of transporting rodents to the desired destination. Bring the tunnel towards the rodent and gently guide it in. Once inside, slowly tip the tunnel backward to have the rodent fall back onto a hand or surface. Move to the new destination and tip it slightly forward to direct the rodent to exit the tunnel. This technique requires minimal contact between the handler and the animal. 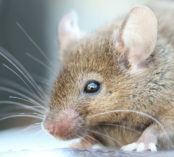 Therefore, it is most beneficial for more anxious and unpredictable strains of rodents that have not habituated to scooping techniques. Restraint may be necessary for more detailed inspections and procedures, which involves implementing single-hand holding methods to gain control of the rodent's body, limit the possibility of a bite, and perform a minor procedure with the free hand. First, pick up the animal either through the scoop technique or using the handling tunnel and move it to a secure surface where it can easily grip. Once the rodent starts gripping, hold the proximal end of the tail with one hand while grasping the loose skin of the nape with the thumb and forefinger of the other hand. Observe the animal closely throughout to ensure that there are no signs of becoming cyanotic. At any time before or during handling, take note of the rodent’s behavior to ensure that the right technique is being employed. Rodents are generally inquisitive animals and are likely to cooperate with the handler. A rodent that is fleeing and hiding from the handler is an indication that it is responding anxiously and fearfully to the situation. Researchers use lab animal ID system in order to differentiate rodents during long-term studies. Each of the available methods provides different advantages and disadvantages, all which should be taken into consideration for optimal identification. Ear Notching is a simple method that involves punching small holes in a unique pattern to the rodent’s ear. The notches represent a numbering system, which is then compared to an ID chart to differentiate the animals. While ear notching is quick, economical, and relieves the animal of carrying heavy devices, it can be a painful process that promotes future complications such as infections. The notches can also become torn if the rodents are prone to infighting. Furthermore, the researcher must wait until the rodent’s ears are fully developed. Toe Clipping is another option that involves the removal of up to two distal toes. This technique can be performed on neonatal rodents (less than ten days old). It is a quick and permanent method that reduces identification errors. However, it is important to note that this invasive procedure may cause locomotory impediment, including gripping and climbing. Moreover, there are reasons to believe that this method may cause considerable pain both momentarily and subsequent to the procedure, regardless of whether the bone contains bone or cartilage at the time of the clipping. Microchipping, or RIFD, is a technique that uses transponders to implant a microchip within the subcutaneous region of the rodent. Identification thereafter is automatic, and only requires a specialized scanner to read the ID number. It also gives the ability to monitor information related to core body temperature, heart rate, etc. Unfortunately, it is an invasive procedure that requires specific skill sets to apply the microchips correctly, which otherwise may migrate from their original area. 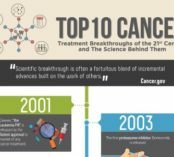 Complications ranging from infections to tumor growth have been noted. In addition, the initial outlay for the equipment is expensive. Ear Tagging involves attaching a unique tag to the pinna of the ear. In general, ear tags are painless, inexpensive, and easy to apply and read. However, more primitive metal tags can become faded over time, resulting in potential inaccuracy during identification. Depending on the size and weight, these tags are also prone to fall out, especially during infighting, and may subsequently deform the pinna. With more advanced tagging system such as RapID Tags, researchers can optimize the advantages that ear tagging provides while reducing many of the drawbacks. For example, RapID tags are much lighter, easier to apply and capable of generating millions of unique codes. These tags are unlikely to detach from the ear as a result of gravitation pull or infighting, since it is applied to a central portion of the pinna. Many common complications such as infections are more manageable and preventable. Furthermore, it provides the ultimate benefit of automation, which will systematize the entire identification process. Proper education and practices in handling and identifying animals are key to being efficient and effective while reducing callousness towards laboratory animals. Stressors related to handling and identification will introduce undesirable variables that may alter the data necessary for an accurate result. Choosing the best techniques and tools are therefore an utmost priority in optimal experimentation.